I have no time for any of those flowery words or fancy alliterations today… It’s time we get down to business. And where oh where do I begin? Perhaps we’ll start with the biggest chunk of business I’m dealing with… my book. Remember that thing I did back in November? Well until a few days ago I hadn’t done more than tossed it a dirty look from across the room, but now? Now I’m in full on edit mode. And by edit I mean fix egregious typos. Is that editing? No… it’s more like pre-editing because for any serious editing I’m handing the thing off to a man I know… but that’s later. It’s too soon for that now. Why? Why would you even ask why? Isn’t it obvious? It needs to be PRE edited. Plus I’m in the midst of letting a select few brilliant souls with minds that I hope are able to see through the horrible typos and severe need for editing read it. Enough of my book… let’s move on to another matter at hand. Blogging. I do it. Frequently. Almost everyday. Recently I was asked to contribute to a place that I should feel right at home, The Bad Mommy Blog. I know, bad, mommy, blog. All things I love right? Maybe it will be a nice fit, only time will tell. Or I don’t know maybe people will. If you feel so inclined you can check out my first two posts. Don’t be shy about saying ‘hey’ to the other ladies too. And then last but certainly not least is the award..
Oh CamiKaos loves awards… the only question is which do I love more; receiving the awards or presenting the awards? 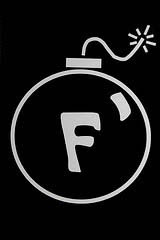 F bomb award. Isn’t it lovely? All effy and bomby with the little sparkling fuse. I am honored Mie, to add this pretty thing to my trophy case… thank you. Now who shall I give it to? Think think think? Who deserves and would benefit from an award as glorious and prestigious as this? I think I know! My new pals over at The Bad Mommy Blog… I barely know any of you but I know you all deserve this… For being bad mothers (shut your mouth) I’m handing this out to Bridget, BecauseIcan, Expensive Mistakes and Cheap Thrills, Angel, Sheena Gates, Stephanie, Sweetass RSA and Kerryn. Enjoy ladies, and make the most of it. that is a great mother (shut yo mouth) award! she made such acute award didn’t she? love it. i promise to kick my own *ss and get back to reading. cuz that thing wot you wrote is brill. i need to shut myself in a room and read read read. oh god that would be heaven. Correcting typos counts; it’s moving forward.I’m inspired. flutter: Oh how I love you girl.holllllllllllllllllly: I just thought you should have a few extra l’s today… I wonder why… Anyway. I am planning to do a little more reading of my own this afternoon…Lisa: I only made it through 6 pages yesterday. Today when I get home from K’s art class which I am currently running out the door for (can you see me running, look at those long strides i am making out the door) I am going to sit down and edit edit edit… until I get bored. Yes I have read much of it (as you know) and so far I really like what I’ve read.Glad you like the F*ing award. I followed you over to the Bad Mommy Blog the other day. They are worthy recepients indeed! awesome!!! can’t wait to boast!!! good luck with the editing cami! hope it goes well!! Don’t ya love it when you get an award that doesn’t clash with your blog decor? Congrats! You’re one bad mutha! Let me know how contributing goes. I was invited, too, but I don’t know if I’m bad enuff. Ha! The award brought a smile to my face. Let us know how the editing is going – and please edit sensitively. Your work is instinctive, so don’t change that at all! David: That is by far the most helpful piece of advice I’ve received on this novel writing process. Thank you so much.Julie: Oh I think you’re bad enough for them… they question is… are they bad enough for us? You are a better woman than I, having a book that needs editing and all. It’s only a matter of time before my students realize what a hack I am.THANK YOU for the f*ing award; I’m so excited to place it prominently on my cybermantel. Yes! Sharing of the writing–not too long ago, that was really hard for you, miss. I’m so proud! I’m too tired to come up with witty, so it’s straight honesty right now! Ooo congrats on the award sweetie.And the book? Wow. I need to mae a move on mine now, but I’ll wait till after the op…because I am a chicken.